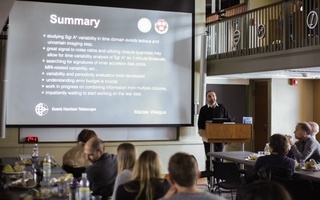 Harvard’s newly formed Black Hole Initiative received funding two weeks after world-renowned astrophysicist Stephen Hawking spoke about the initiative to a packed Sanders Theatre on April 19. The John Templeton Foundation gave $7.2 million of funding over the next three years to the Initiative. Astronomy department chair and Director of the Black Hole Initiative Abraham “Avi” Loeb hailed this project as an “interdisciplinary” fusion of the humanities and sciences. “The thing that makes it most attractive [for students in the sciences] is the opportunity to speak for people from humanities,” he said. At the April 19 event Loeb spoke about the goals of the Black Hole Initiative. Loeb said that the the Initiative received a space at 20 Garden Street, the current location of the Center for Math and Application. He said they hoped to occupy the building by the end of the summer. History of Science professor Peter L. Galison echoed Loeb’s statement about the importance of the initiative. Galison also spoke about the "deep philosophical and cultural questions” that black holes raise. Galison said he will also be “making a film about the Black Hole Initiative,” exploring the deeper philosophical questions raised by the existence. Loeb said he hoped the initiative will be “an attraction for students” who look forward to studying the “fascinating” subject. —Staff writer Alec J. Grigorian can be reached at alec.grigorian@thecrimson.com. Follow him on Twitter @alecgator23. The Faculty of Arts Sciences launched its “Great Teachers” video series Wednesday, a project which highlights pedagogy in video clips that showcase the teaching methods of prominent professors across the University. The norms of Harvard theater restrictively dictate where and how actors and characters of color can exist; as unintentional as it may be, the theater community at Harvard oversamples and over-represents whiteness. ​World-famous theoretical cosmologist Stephen W. Hawking discussed the history of and recent breakthroughs in research on black holes at the inauguration of Harvard's Black Hole Initiative. Hawking, who died last Wednesday at the age of 76, was a renowned English theoretical physicist and cosmologist.